Fancy yourself as a bit of a designer? Maybe you have a creative side that needs to escape? Well this competition might be right up your alley. The first step is probably to download the template. We have a white t-shirt or black t-shirt that you can use as a canvas, as well as a PSD template with both colours in it. When designing your t-shirt you must incorporate the Adreno logo, however other than that you are welcome to let your mind run wild (as long as it isn't offensive). Once you've finished your design simply upload the image to our Facebook wall before May 31st so everyone can see your creation. We'll be moving all entries to the T-shirt Design Competition folder so if you ever want to see all the entries you can check here. 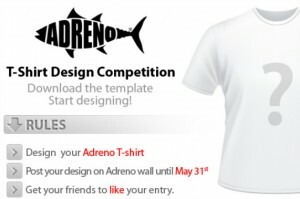 While the decision on which shirt wins will rest solely with Adreno, we want to see what everyone else thinks so make sure you Like your favourite entries and encourage your friends/family to Like yours as we are much more likely to pick a design that our fans Like as well. Oh yeah prizes.....all entires must be in by May 31st with the winner being announced on June 3rd and they will receive a Beuchat Mundial Reversible Wetsuit which carries an RRP of $375. All this information can also be found on the T-shirt Design Competition tab on Facebook which is found underneath our profile picture. Also remember you don't have to be a graphic designed to get involved. As long as you know how to use Paint you're atleast in with a chance so have fun, good luck and we can't wait to see your designs.